Making special appearance on CSReview today is actor Larry Laverty, sharing his life story and his carreer in film. Larry Laverty in Treasure State. Image courtesy: Treasure State, the movie. CS: Welcome to CSReview, Larry. You have gone a long way in your filming career, starting modestly – but look at you now! What brought you on this journey? Why cinema? Larry Laverty: I had my favorite movie stars I loved to watch as a kid like everybody else, but acting itself always seemed very strange to me. I just couldn’t imagine myself doing the school play. Sports and other outdoor activities were what interested me. So, years went by… Then, when I was 24, in my last year of college out of the blue I took an acting class. The instructors, both Broadway veterans, told me I was a natural, born entertainer, and to this I laughed, but took their appreciation to heart. At about the same time through a number of jobs I’d worked I felt like I just couldn’t surrender the rest of my life to a corporation, spending 8 hours a day in a cubicle. I’d worked quite a variety of jobs actually by that point, having started working when I was 11, and I enjoyed every one of them, exploring different roads in life. And then it hit me. As an actor, I could experience a touch of what it’s like to be a lawyer, a doctor, anybody. I was on my way. But my search for a career wasn’t over. While I loved doing the plays and the musicals, being confined to a stage took a lot of the realism of the experience away for me. And since I’d spent a lot of time through my childhood on the streets, being on location to shoot a movie just about anywhere feels right at home to me. After all, I guess it all makes sense as I grew up watching more than my share of movies and TV, with my parents at drive-in movies, at the neighborhood movie house with buddies, and at home on TV with anybody I could get to join me. I’ve always loved movies, more than books, more than just about anything. How it began – I was backstage at the theater company I’m still a member of, in the middle of a rehearsal, when I overheard two other actors talking a film audition they were going to the next day. I chimed in, went, landed a role, and that film, ‘Deadlock’, with James Hong, was the beginning of my future career as a film actor. CS: Fascinating, Larry. What led you to eventually choosing such curious characters for your trademark? Is there a part of you in them, or perhaps a particular personal experience that drew you towards playing such personalities? Larry Laverty: Well, I’m a bit of a character myself, rarely having taken a conventional path in life. I know my heart and I’ve always tried my best to follow it. Ever since first grade, I befriended the friendless and have felt something for the odd duck. Despite all this and because of my looks and general demeanor, I played a bus load of conventional characters throughout my first ten years in the business. From L.A. to New York City, I’ve played nice dads, cubicle-hugging corporate guys, and cops of all kinds. Looking back in visual endeavors like film and TV are, I’m grateful that I fit in so easily right off the bat. But once I got a handle on what I was doing as an actor and the potential that was involved, it became much more rewarding to drift away from playing mainstream characters, who by nature toe the line, and move over to exploring the nooks and crannies of humanity as is most prevalent in society’s oddballs. I love playing oddballs. There’s a bountiful supply of quirks, complications and illnesses in the human race and the oddballs are the most prone to live with them at a noticeable level. Why I think it’s even safe to say that I’ve become an oddball myself. CS: That’s quite a revelation! I do too agree with you about illnesses in the human race though. So much to mend out there, isn’t it… Now, back on the set, what goes through your head when you are in front of the camera? Larry Laverty: Ninety-nine percent of the time that I’m on a set I’m living the life of the character I’m playing. I don’t do much chatting or fooling around. I’m focused on the current scene of the story being filmed and prepared to experience whatever it is that my character has coming down the tracks. I spend a good amount of time, more than most actors I know, preparing my characters before the shoot starts and I usually get pretty far away from who I am as Larry. I’ve cultivated this transformation for 10-15 years now and sometimes scare myself with the lives I create and how deeply involved in them I get. Oh, and the other one percent of the time, I’m likely to have been painfully pulled away from my character by some technical filmmaking issue. You see, I’ve been lucky enough to work with a few Academy-Award winning directors and cinematographers along the way and I’ve learned from them. I’ve also produced a few projects myself, so it pains me when I’m out there working and notice that the lighting could be better or the placement of the camera could be improved. No matter which frame of mind I’m in, I’ve done this job often enough and long enough to just take a deep breath and remind myself that I won’t be curing cancer this day. Images courtesy: Larry Laverty. Collage design: Camilla Stein. CS: I am curious about the following. You played once a minor role of a bystander in the TV series Nash Bridges of which I am a long time fan. By that time you had already worked several years in film. How did you feel landing a small part being on the set of the two-million-dollar-per-episode production next to big shots and obviously great talents? Is there such a thing in cinema as a small part? What have you learned from the experience? Larry Laverty: Nash Bridges actually represents far more of my life than just the three lines I uttered as a minor character in one episode. I don’t talk about it, but in need of money I took a low-level crew position on the show, starting with the first day of the first episode, and I worked regularly through the first two seasons and sporadically through the show’s sixth and final season. I hung out with Don Johnson, listened to Cheech play the guitar, and drove the Cuda. When I went in to audition for the little role I played, the episode was to be directed by the show’s DP, so he knew me, we joked around and I did the job. There really is no such thing as a small part in film or TV or theatre because it’s each actor’s responsibility to do their part in keeping the audience wrapped in the story. I learned more about TV production, celebrities and life from my time as part of the family of that show than I can ever put into words. CS: What a story! Such memories are worth being put in a memoir. Tell me, if not films, what would it be? Larry Laverty: At this point, some 25 years into this experiment of mine, I really can’t imagine doing anything else. But I’m not above sharing that I’ve second-guessed my choice to do this most every step of the way. My teachers in school when I was young in all the Advanced-Placement classes wondered why I wasn’t living up to my potential as I’d cut school to go hang out with the other long-hairs at the neighborhood rope swing or some other adventure of the sort. I’m sure they’d scratch their heads now too, with the way I’m putting my little brain to work. I actually did set out at one point years ago to work in a job where I could protect our environment and save animals and I’m sure that’s what I’d do today if for some reason I couldn’t do acting. I’d do that or produce documentary films like the one I’ve been working on for a number of years about the World War II generation, to try to raise human consciousness and make the world a slightly better place. CS: That is a very noble aspiration, resonates with my own way of looking at things. To proceed, one word – theater. What did you take with you from its backstage onto the set? Would you consider actively acting in theater as part of your today’s career? Larry Laverty: I marvel at what in the world came over me to want to try acting in the first place, let alone getting the idea to do plays and musicals up on stage in front of all sorts of people I don’t even know. I’d sang in various church choirs since I was 8 years old, and even studied singing, so I guess that was really my entree into professional acting, through singing. The size of the facility though, where I first got started and was a member of the company, was more intimidating in a way then performing itself. It holds 2,000 people and that’s a big space to fill up. But its funny how if you stick with something long enough, you can actually get good at it, despite yourself. I played in over 15 plays by Shakespeare and musicals by all the Broadway greats, and I was studying acting in a couple of classes at the same time. But in looking back, my years on stage really came way too early in my career for me to appreciate it all. I was up to my ears in my search for how to be an artist, how to play, and this didn’t come easy, especially since I’d shunned acting through my life to that point. I really didn’t know what I was doing and was learning something new every day about what performance is all about including tapping into the power of the imagination. Today, once every blue moon, it crosses my mind to do a play again, but the the long-time director at Woodminster Theater in Oakland, Jim Schlader, who I loved and looked up to, just passed away last year and I’m still making peace with that. I am lifelong friends with the family who manage that theater company I originally started with, especially as their roots are in Wisconsin. I lived in Wisconsin, and we’re all Packer fans. I still help out in any way I can with that company. CS: I am sorry to hear about Mr. Schlader, I hope you’ll be able to find your peace. Where is Larry Laverty today, professionally and as a person? Are you growing, are there new goals, a new Mount Everest waiting for you? Larry Laverty: In the past two years, I’ve played a number of characters who were just hanging on to life by a thread. Their emotional states were so raw, so fragile, that within a single scene, I’d find myself sobbing and then later laughing hilariously. At the end of each day on these projects, including the soon to be released ‘Sisterhood of Death’, I knew I’d made it. 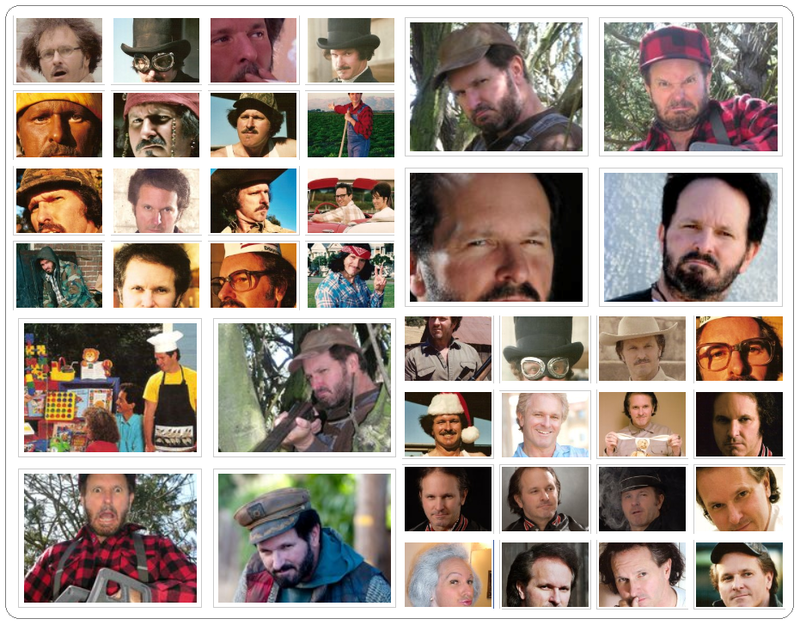 I’d made it to the point in my career as an actor that I’d been searching for all these years. I now feel competent, at one with my imagination, able to play any character that comes along and do it as well as anybody else can, easing my own personal pilgrimage for artistic expression and legitimacy… I’d reached the mountain top. Now, the next peak to climb is on the business side of things. This means getting back to business in L.A. after having been away for over eight years, getting back in to TV and big-budget movies, working with the best of the best. But don’t get me wrong, I’ll always be looking deeper into humanity – and my own humanity – as I put my characters together. After all, growing as a person and living life as fully as I possibly can are the reasons why I became an actor in the first place. I anticipate working with them again in the coming year. I also expect to go to Canada to work with Derek Milton on a film that I’ll be co-starring with Brenda Bakke. One of the two films due out in early 2012 is Antony De Gennaro’s ‘Sisterhood of Death’. It’s a comedy, set in Seattle, and has these humorous overtones of classical horror. The other film is Andrew Wiest’s ‘Treasure State’. It’s a family drama, set in the wilds of Montana, about two feuding ranch families. CS: You certainly are very busy, and sound very ready for a leading role. I am looking forward to seeing your projects fulfilled on screen. You said once that you wanted to go work for a greater good, in the non-profit sector. As an actor, has your passion for charity faded over the years? Larry Laverty: On the local TV news in the past month here, I watched stories about how somebody had been killing ducks and geese at a local city park, somebody had thrown a dog from a car, and somebody with a nail gun had shot down a beautiful hawk. These events all took place near where I live and in the past month alone. They’re a drop in a deep dark bucket. Last week, I went for a walk at a nearby regional park that sits on a hilltop. As I neared the hill’s crest, I heard the sound of heavy equipment. Then, at the top, I looked down into the valley below. What had only a few months before been a peaceful oasis for animal life, dotted with majestic ancient trees, had been scraped bare to make way for still more giant, super-sized houses. And there in the corner of the valley, I spotted a deer, a lone deer, just standing there. Oh yes, I’m just as passionate as ever about the impact that man continues to have on our beautiful world. Many times I wish I could become some kind of an almighty character and right all the wrongs, inject a little more harmony into the song of life. Now that would be a character worth playing, and a Mount Everest worth climbing. I had intended to do something a little more mainstream with my life, affect in some way my passions of preserving what’s left of our environment and affecting animal welfare. So to this day, I support the Nature Conservancy and the SPCA among others periodically. I was a Sierra Club member years ago but tend to stay away from organizations that get to embroiled in their own politics. CS: That is a very dedicated resolution, there are many professionals in film industry with similar humanitarian objectives and I wish you to hook up with these wonderful people and create more such wonderful projects. Good luck with your new Everest! Thank you for talking to CSReview, Larry.